Models, examples, checklists, articles and information to help you take your quality system - and your care - from good to great. Where is your organisation on The Quality System Maturity Scale? Use my scale to start a conversation about the health and effectiveness of your current quality system - and to plan how you'll evolve it to create even better care and experiences for consumers. Check out what 120 community members can do when they collaborate on the care they want from their health service, and how everyone must work together to achieve it, using the strategic quality system. Easy to see the SQS Purpose, People and Pillars of governance there from the consumer and community perspective. Magic! Care and services should be GREAT! But! - care and services can't be consistently Great until we clearly define what that means, and align our organisations around achieving it for every consumer. Many health service staff do not see their organisation's quality system as a useful support for providing good care. So what are we going to do about it? Western Health, a large multi-campus teaching health service in western Melbourne, implemented the Strategic Quality System to bring all their good improvement work together, identify their gaps and focus more completely on their consumers. Here's an overview of their progress a year later. Great care for every consumer is not set and forget - you have to work at it! Here's 10 leadership practices that will help guide your organisation to care greatness. Change is an ongoing challenge in the world of creating quality care. But too often, change doesn't work, or doesn't stick, and you're back to square one having wasted time, energy and resources for little gain - and annoyed a whole lot of people in the process! This is because we usually focus on the project management side of change - the tasks required for things to be done differently - and forget that people also need to make a mindset change in order to support the change to be successfully implemented. 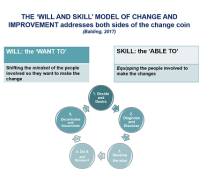 I developed the 'Will and Skill' change model to address both of these key change components in one change process. These are my current ‘go-to’ books for understanding and making change for improvement in complex organisations. They live in the real world and are full of useful explanation, practical solutions and tools for making process and culture change a reality.